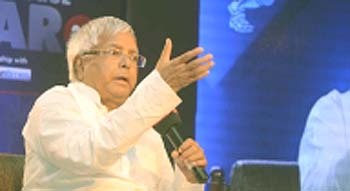 New Delhi, April 9 (IANS) The CBI on Tuesday later will oppose the bail plea of RJD chief Lalu Prasad in the fodder scam. The Central Bureau of Investigation (CBI) wants the court to dismiss Lalu Prasad's plea that has been sought on medical grounds. The agency said the Rashtriya Janata Dal leader wants to actively participate in political campaigning and activities related to the Lok Sabha elections starting April 11, and his medical reasons are just excuses. The CBI advocate sought courts permission to file an affidavit opposing Lalu Prasad's bail plea claiming that the former Bihar Chief Minister has in the garb of illness successfully managed to spend most of his jail time in a special hospital ward ever since his conviction in the case. Many top level politicians have even visited him. The CBI said Lalu conducted political activities from the special ward in the hospital.